Three children adopted from Africa made the Baxter’s dream of a family complete. But the adoption turned into a traumatic journey. Inept bureaucracy, extreme mental health issues, and a system that failed to support a loving family, left them broken, with two vulnerable children lost, one to the streets. Their oldest child, their son, was acutely affected by cultural and gender issues, a controlling nature and an all-consuming need to lead. What was thought to be post-traumatic stress was blamed for his frequent psychotic and violent episodes which escalated as he grew. He subjected his family to years of domestic violence behind closed doors. He was later diagnosed with a then little known and largely misunderstood condition called Reactive Attachment Disorder. Their middle daughter also displayed all the symptoms of the same disorder. While most children will accept punishment, accept the word no, may temporarily rage but then return to the loving fold of the family, RAD children have no such bond or even a feeling or need for love, acceptance, discipline and security. The smallest rebuke can send them wild. And, in the end, the children were enticed away by a family exploiting their vulnerability, where those children felt there would be no boundaries, without ever looking back, without ever considering the family that loved them so much. 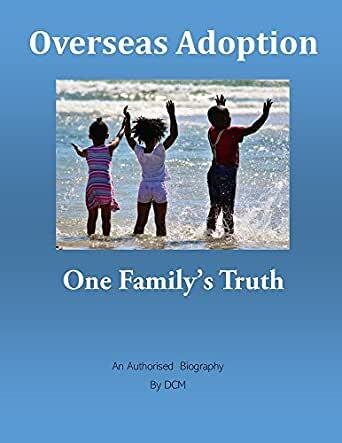 This book has been written to help enlighten future adoptive families, some who may experience a smooth progression into family life, others who may experience challenges, be they minor, or, like the Baxter’s, extreme. Anyone who is thinking of adopting children from Africa should definitely read this book first. It is well written and gives you the truth about the children and parents involved. It is easy to read and leaves you wondering why.